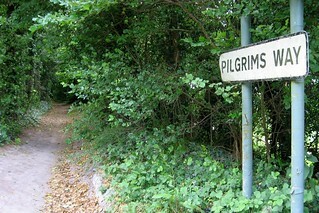 Pilgrims Way is an old straight track that runs across the North Downs. Depending on your point of view, it conveyed pilgrims east from Winchester to the shrine of St Thomas Becket in Canterbury, or west from the landings in Kent where the channel is narrowest to the sacred landscape of Avebury Henge and Silbury Hill. Or it could be a number of tracks linking useful places (something which armchair archaeologist Alfred Watkins referred to as a "ley line") which nineteenth-century military cartographers romanticised with a fanciful name. Whatever it is, the powers that be clearly think it deserves this very official name plaque.